The architect of this building is designed by Productora, this modern mountainside home is ideally situated on a northern Mexico golf club. 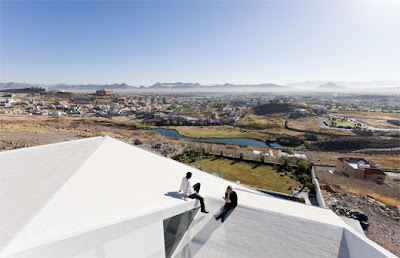 Partially buried beneath the mountain’s slope, Inside, the modern house features living spaces with massive windows that open onto outdoor patios and rooftop decks, providing natural lighting, passive ventilation, and spectacular views from every room. 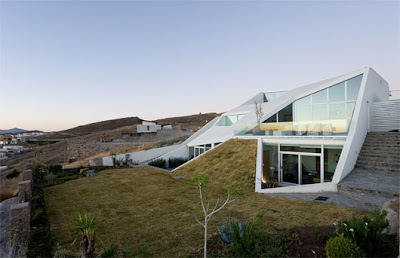 The home innovative roof is designed as one continuous line that inclines up the mountainside. 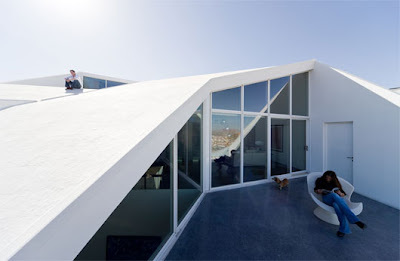 House in Chihuahua has a self-regulating climate control that naturally accommodates the drastic 20-degree drop from day to night. 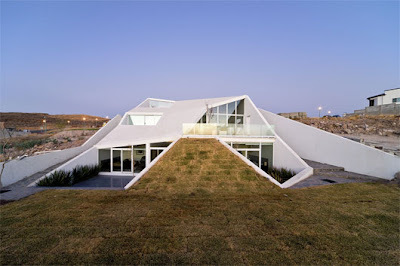 From the outside, the house is a curious sight, with shards of glass framed in a white facade enclosed by grass and earth.